Download Pride Travel Scooter Guide.pdf. The Go-Go Elite Traveller Scooter offers unbeatable ease of transport, tight space maneuverability, and gives you the versatility to change its color, and your style, in a snap with interchangeable shroud panels (Red and Blue). The Go-Go Elite Traveller's compact size allows it to negotiate narrow hallways and tight spaces while also providing stable outdoor performance. Convenient charger port in tiller and one-hand feather-touch disassembly. Take the guesswork out of travel with ultra-simple assembly and disassembly impressive performance. 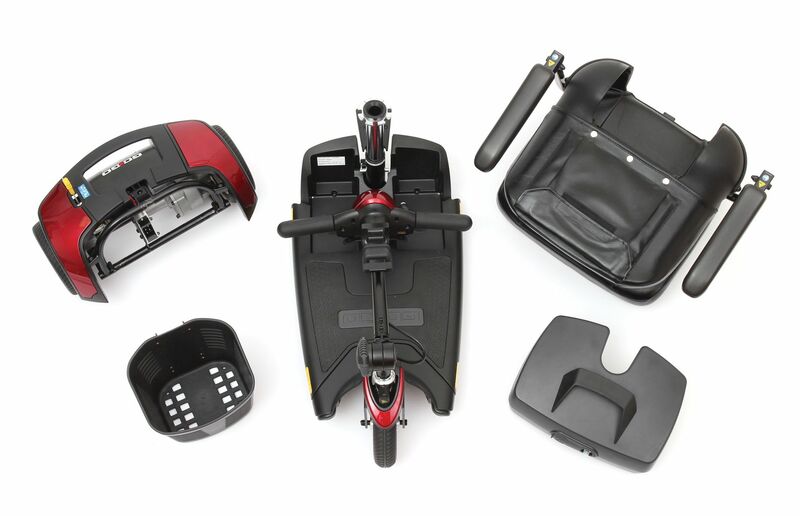 The Go-Go Elite Scooter can easily be broken down into 5 easy-to-transport pieces. With the heaviest piece only weighing 30 pounds, virtually anyone can load and unload the Go-Go. The auto-latching lockup mechanism permits simple frame separation with only one hand. Warranty: Lifetime Limited: Covers the following – Main Frame, Forks, Seat Post and Tiller Frame. Two Year Limited Warranty: All electronic assemblies including controllers and battery chargers. 6 Month Warranty: the batteries are covered by a separate 6 month warranty, provided by the battery manufacturer. See attached Warranty Brochure for more details. Includes residential curbside delivery ONLY to 48 contiguous states. Please call 1-800-861-3211 if you require special freight needs or live in New York Metro or Remote/Isolated Shipping Zone, additional charges may apply. CLICK HERE TO ADD Please call 1-800-861-3211 if you require special freight needs or delivery outside continental 48 states*. *Additional charges may apply. Why I GO-GO, to get out! Convience. Charge and go. Independence. Ease. Speedy. Durable. Freedom. Portable. Zippy. Mobillity. I am able to go almost anywhere, with ease and comfort; The State Fair, Oktoberfest, Football Games, Theme Parks, Grocery Stores and Department Stores. The portable design allows for easy assembly. I'm not lifting anything to heavy(25 lbs-heaviest part) and can put it together while standing, a major plus. It fits nicely in the trunk of my car. Carry your charger with you for any extra juice(the battery life is OUTSTANDING - I've never run out! 12hrs+) Living with mobility issues, because of Multiple Sclerosis, I now have added freedoms since the GO-GO Traveler allows me access that a wheelchair does not. ** Drape a blanket on the seat, it will keep you warm should you need it. That's all this GO-GO Traveler needed. Comfortable. Easy to Maneuver. Easy to Transport. Durable. Can be put in subcompact . Horn pathetic. Back seat cover bad. Travel. Outdoors. Short Trips. Dash around campus. Comfortable. Easy to Maneuver. Easy to Transport. Travel. Outdoors. Short Trips. Indoors. Daily Use. I experience foot issues as a result of my diabetes. 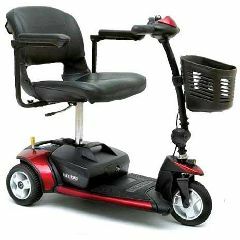 The scooter has helped my with my ambulation and mobility. Overall I like the scooter. It could use a louder horn. Lost the key. How/where do get replacement key? My rear wheel will not turn. How can I fix it, our how do I call to get it fixed. can hard wheels be installed? I am in need of new batteries. do not know where to buy them.please give me a cost for them. Download Manual from Mfg site in a PDF file. Can also be printed.